Thoughts often come to you that can seem unrelated to your circumstances. I was listening to an audio tour of Amiens Cathedral when I realized that I had never before considered the degree to which we value that things are done, over how they are done. The Cathedral at Amiens, in Northern France, is the largest in the country. It’s beautiful! Work began on the cathedral nearly 800 years ago, in 1220, with the major works said to have been completed by 1270. However, the trigger for the line of thought I began above was hearing that an estimated 3,000 people lost their lives in the construction; more than one death, every week, for 50 years. Nowadays we see the structure; we don’t have the details behind the ‘who’ or the ‘how’ of those losses. Thankfully, attrition like that seen at Amiens would be unthinkable these days, but we do see attrition in other ways when insufficient consideration is given to the way we work. Important personnel can be lost from a team either as outright departures, or maybe from having to take temporary medical leave. Beyond the direct effect on personnel numbers, working incorrectly means investing unnecessary time and money. Expending emotional energy also adds drag. The incentives to work correctly are plentiful, and that is without considering the warm feeling that you get when you not only achieve your goals, but do so in a manner that is congruent with your values; otherwise the success, while still treasured, can feel like an opportunity missed. Off the top of my head, I was finding it hard to think of examples where success is lauded at least as much for the method as for the result, although one that probably qualifies is Hannibal’s defeat of the Romans at Cannae, in 216 BC. The Romans, with around 85,000 men, had a force about 50% larger than Hannibal’s. Depending on the account you read (exact figures are hard to come by in antiquity), the Roman army lost anywhere from 50 to 80,000 men, while Hannibal is believed to have lost in the region of 5,000. The tactics were brilliantly executed, with the victory becoming one of the most emphatic the world would ever see, but it is the manner of the victory that people obsess over. By contrast, Hannibal’s results were short-lived: the battle had been won but Carthage still lost the Second Punic War, and Hannibal ended his life in suicide; Rome endured. The manner of the victory at Cannae became the bigger achievement. Results count in business, but I have seen more than enough in great method or just sheer guts, even when the goal is not achieved, to know that it is not the only thing. Where the debate runs, is the degree to which things must be done the right way, and whether a missed goal is close enough. That will vary from person to person, and from situation to situation. However, a sense of perspective is never a bad thing, and few of us these days are smiting our enemy in battle, or taking 50 years to build an enormous structure in honor of divinity. Begin. And when you stop, begin again. Time is the most precious resource any of us have, and with every passing year I find myself becoming more disciplined in how I spend mine. I recently started tracking my time after attending a presentation at work, on Productivity. The speaker claimed that we are productive for fewer than 3 hours in every day, and I didn’t believe her. It’s lucky that I’m a bit of a data junkie because I started tracking my time – both work and personal – to see how that might be used better. I’m more careless with this resource than I thought, so I decided to look at the areas where I saw myself being least productive. I opened a Facebook account primarily to stay in touch with friends scattered around the globe, but nothing in life is static. As the tool has evolved, as my friends and interests have grown, so has my use of the tool. Convincing myself that I am now using Facebook to learn, and to grow – and not simply to stay in touch – I was sure I was applying suitable filters, and indulging in sufficient self-restraint, to limit myself to the levels of downtime that we all need. I wasn’t. Now I’m not spending 72 hours locked in a dark room clicking from cat to dessert, to dancing child, to “the 23 best ever videos of piglets eating cake”, and then on to “the 15 most ridiculously awesome pictures of dog slobber on rear car passenger windows that look like Jesus”, etc. But I am definitely wasteful, and seeing the data helps. However, there are gems in the noise of cats and food. A recent post quoting Hugh Laurie stuck in my mind, and I see the same message again, in a video on productivity that I found. Almost immediately after the Hugh Laurie post was an article shared by Terri Lynn, on how massage therapists should use social media. Both are responsible for the re-ignition of this blog – something I have wanted to launch for sometime, but whose commencement constantly falters. 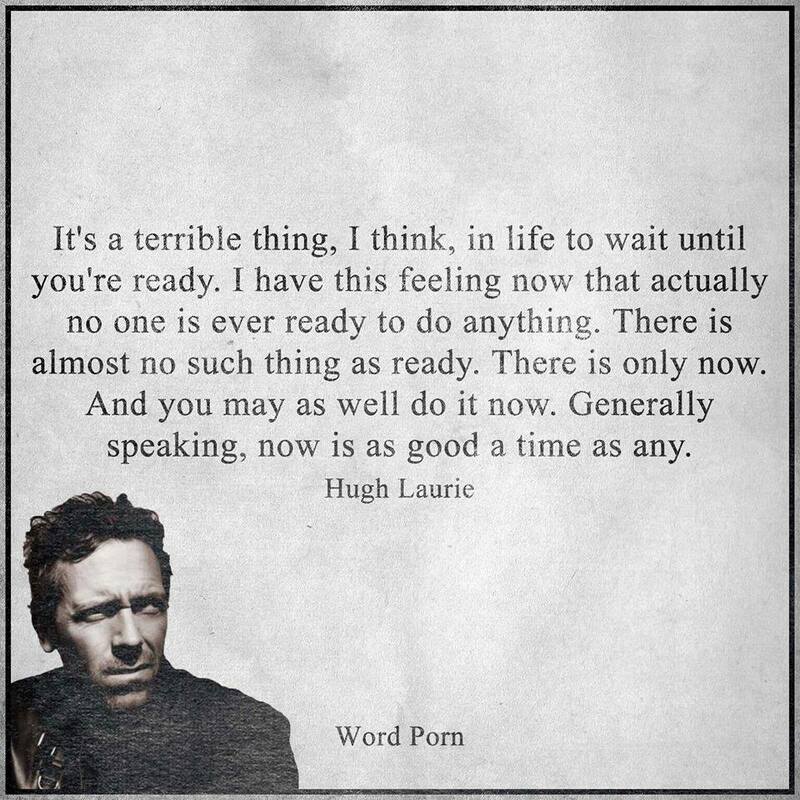 The amalgam of the above two posts is that one should not wait until one is “ready”, and that doing something consistently often will get me where I want to be faster than simply contemplating a start (presumably while I look at lists of amusingly shaped vegetables on Facebook). Neither of these two important points for best use of our time are epiphanies, but we aren’t always so ready to act on what we know, and knowledge without action is… (well, pick your favorite famous ending to that line).